With the App Store being launched in 2008, I am not so sure that anyone would have predicted the insane levels of success that it would enjoy during its infancy. We have to remember that Apple’s application market is not even four years old and already has close to 600,000 applications on it with over 100,000 registered developers regularly adding to that total. We are pretty sure that Apple would have taken great pride in announcing to the world that they were approaching the 25 billionth download on the App Store, offering a $10,000 iTunes gift card to the person who manages to download that app. It seems that another milestone has been breached, as the official App Store’s Facebook and Twitter accounts let the world know that the 25 billionth application has been downloaded, and the competition has come to an end. The Apple homepage has quickly been updated to let people know that the competition is over and downloading hundreds of free-of-charge applications in the hope of winning is no longer necessary. The official website has been amended to display a custom created graphic which reads "A billion thanks. 25 times over" which follows the trend set in January of last year when the company ran a similar competition for the 10 billionth application download. 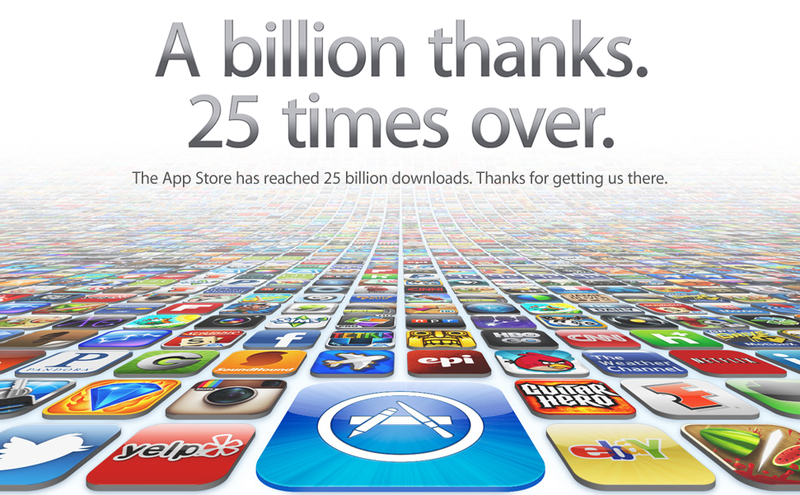 The image contains a curved, tiled floor of application icons showing some of the most popular apps in the Store, but, we are yet to find out which app was the 25 billionth to be downloaded. Full competition rules are still available on the website with Apple advising people to check back in a few days to see details of the winner. No doubt, this will also be announced through the official App Store’s Twitter and Facebook accounts. In January 2011, when Apple ran a similar competition to mark the 10 billionth app download, the winner was British based and lived in Southern England. The 10 billionth downloaded application was a free of charge offering called ‘Paper Glider’, which we are sure did no harm to the developer’s downloads going forward thanks to all the publicity on the official Apple website. The fact that this competition has come so quickly just proves how much the App Store is still growing considering that between the launch date of mid-2008 and January 2011; 10 billion applications were downloaded. That total represents approximate downloads of 4 billion apps annually from launch until the first quarter of last year. It has been just over twelve months since that competition, and in that time frame; 15 billion applications have been downloaded which represents a staggering increase in App Store traffic. We are pretty sure that it won’t be long until we see the next milestone being hit by the company. If you entered the competition, then keep your eyes firmly fixed on Apple’s website and we wish you the best of luck.